Noon Forum Examines “The Cyprus Crisis: ‘A Declassified Dossier"
Noon Forum: The Cyprus Issue: "A Declassified Dossier"
Panelists Affirm Greece’s Strategic Importance to U.S.
AHI offers several exciting programs throughout the year. Each spring, AHI’s gala “Hellenic Heritage Achievement and National Public Service Awards Dinner” honors the best and brightest in the Greek American community; in the fall we hold a conference on “The Future of Hellenism in America," held each year at different cities around the country; and in the summer the “College Student Foreign Policy Study Trip to Greece and Cyprus” a two-week trip to Washington, DC, Greece and Cyprus college students have the opportunity to see and experience first hand foreign policy issues affecting US-Greece-Cyprus relations. AHI’s members care deeply about the United States’ relationship with Greece and Cyprus and their neighbors. Following Pericles’s admonition that good citizenship requires involvement in public affairs, we recognize the important role played in a vibrant democracy by alert and engaged citizens. Each year, AHI initiates congressional legislation, issues policy statements, and serves as an effective watchdog on issues affecting U.S. relations in Southeastern Europe. Key issues have included ending the illegal occupation of Cyprus, the treatment of the Ecumenical Patriarchate, aggression in the Aegean Sea, and the U.S.’s response to the dispute between Greece and the Former Yugoslav Republic of Macedonia (FYROM) over the latter nation’s name. 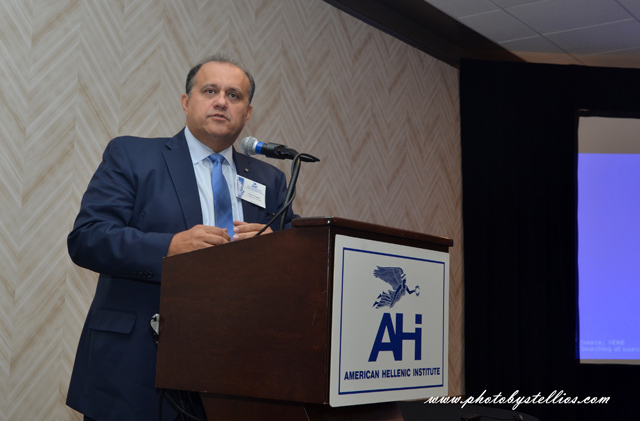 WASHINGTON, DC — The American Hellenic Institute (AHI) hosted a panel presentation featuring U.S. 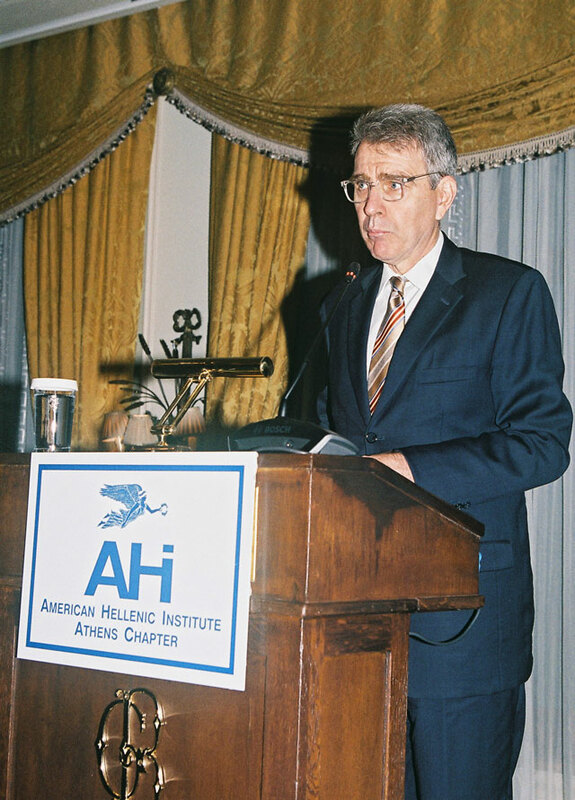 Ambassador to Greece Geoffrey Pyatt as keynote speaker, Nov. 29, 2017, at the Hotel Grande Bretagne, Athens, Greece. Ambassador Pyatt, and four panelists, which included Greece’s Deputy Defense Minister Dimitris Vitsas, all spoke on the topic, “Greece as Strategic Partner in the Eastern Mediterranean.” More than 200 persons attended. AHI President Nick Larigakis opened the panel discussion with welcome remarks that focused on AHI initiatives that serve to strengthen the United States-Greece relationship. 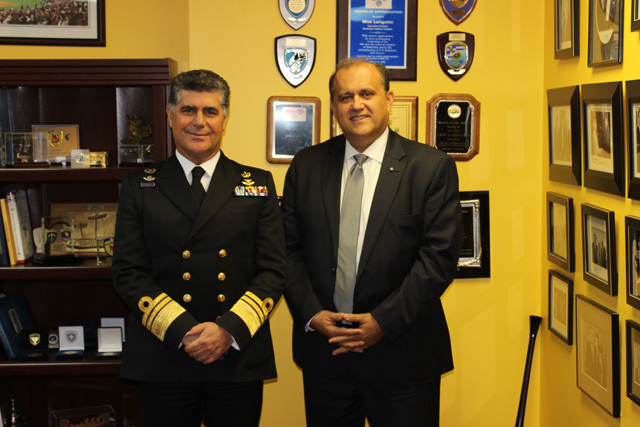 WASHINGTON, DC —The American Hellenic Institute (AHI) hosted a reception and presentation with Vice Admiral Nikolaos Tsounis, chief of the Hellenic Navy General Staff, at the Hellenic House, November 8, 2017. The presentation served as an integral part of the vice admiral’s Washington, D.C. visit during which he also met with his counterparts at the Pentagon. 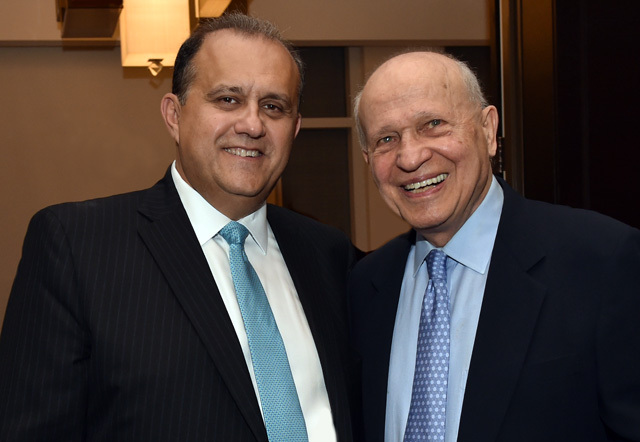 WASHINGTON, DC — Colleagues, family, and friends came together to commemorate the 30th anniversary of American Hellenic Institute (AHI) President Nick Larigakis’s leadership and accomplishments at the Institute. The celebratory event hosted by the AHI Board of Directors was held at the Hilton McLean Tysons Corner, Va., October 27, 2017. 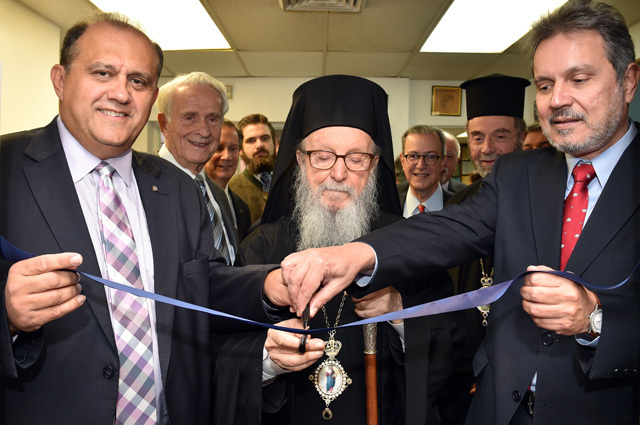 Washington, DC- The American Hellenic Institute (AHI) held a ceremony to rededicate the AHI Foundation library in honor of E. John and Cleo Rumpakis, October 27, 2017. His Eminence Archbishop Demetrios, Geron of America, presided over the ceremony. 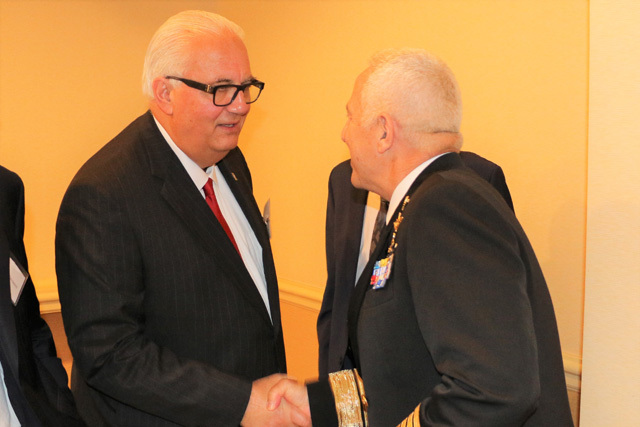 WASHINGTON, DC — Lexington Institute, a nonprofit public-policy think tank, in cooperation with the American Hellenic Institute (AHI) hosted a high-level policy luncheon discussion for Admiral Evangelos Apostolakis, chief of the Hellenic National Defense General Staff, on the occasion of the admiral’s visit to Washington, D.C., October 23, 2017, at the Capital Hilton. More than 30 policy experts from the public and private sectors, including officials from the White House, Pentagon, and Department of State; as well as representatives from the defense and security industries and think-tanks, attended the invite-only event. 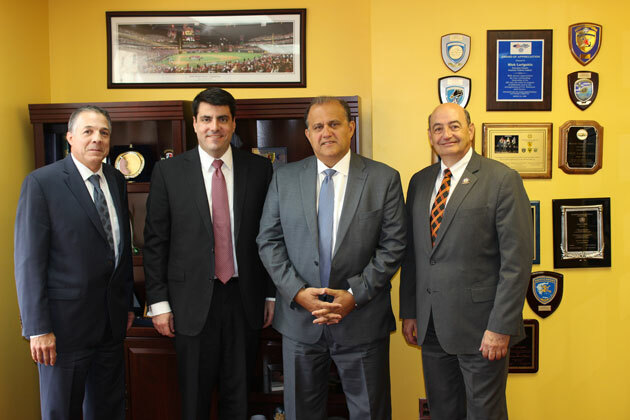 WASHINGTON, DC — Rhode Island State Senator Leonidas P. Raptakis, Georgia Representative Chuck Efstration, and Wyoming State Senator Stephan Pappas, visited Hellenic House to meet with American Hellenic Institute (AHI) President Nick Larigakis, October 24, 2017.
by Van Coufoudakis, Ph.D. and Serge Hadji, Esq. WASHINGTON, DC. 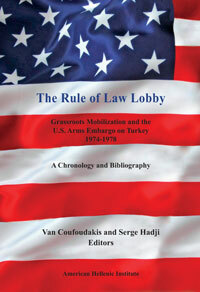 — The American Hellenic Institute (AHI) is pleased to announce its newest publication, The Rule of Law Lobby: Grassroots Mobilization and the U.S. Arms Embargo on Turkey - 1974-1978 by Van Coufoudakis, Ph. D. and Serge Hadji, Esq. The volume focuses on the grassroots mobilization in the Greek American community following Turkey’s illegal invasion and occupation of Cyprus on July 20, 1974 through the lifting of the U.S. Arms Embargo in 1978. 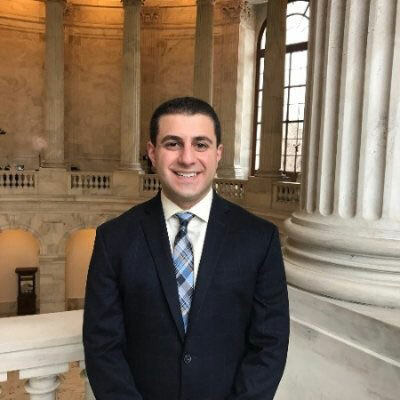 WASHINGTON, DC - The American Hellenic Institute (AHI) is pleased to announce the hire of Constantine Politis as the Institute’s Legislative Assistant and Special Projects Coordinator.